After you import PowerMailChimp, you will notice four new security roles in your CRM. Each user you want to be able to have some level of use for PowerMailChimp will need one of the security roles below. Users should have only one role assigned as the roles become increasingly restrictive. The PowerMailChimp Read-Only user security role is meant to be assigned to any CRM user who would like to see the PowerMailChimp blasts and statistics, but won’t have access to edit/update/delete the PowerMailChimp-related entities. The PowerMailChimp Do Not Allow Send and Schedule Blast security role is meant to restrict users from being able to send a PowerMailChimp blast. They can create and save the blast, but not actually send it out. The PowerMailChimp Hide Jump to MailChimp security role will give users full use of PowerMailChimp, but will hide the button that directs users to MailChimp. The PowerMailChimp User security role will give users full access to the PowerMailChimp functionality, including sending out blasts, and anything else related to PowerMailChimp. The PowerMailChimp Service User security role should be assigned to the person whose CRM login information is entered in the configuration screen, if that user is not a system administrator. The System Administrators will have full use of PowerMailChimp without any additional PowerMailChimp roles assigned. After you have imported the PowerMailChimp solution, select the MailChimp Configuration tab. Add your MailChimp API key to the API key field, this will allow you to sync data to MailChimp. The Marketing List Sync Duration field is set by default to 1 hour. This means that when you send a PowerMailChimp blast to a marketing list, if that marketing list has not been synced in the past hour, the list will sync automatically. You can adjust this value up to 3 days. Be sure to save before closing. Note: A marketing list is only synced automatically when a blast is sent to that marketing list, and only if that list hasn’t been synced within the time frame set in your sync duration. In the Target Service field, select the Azure cloud location that is closest to your organization. 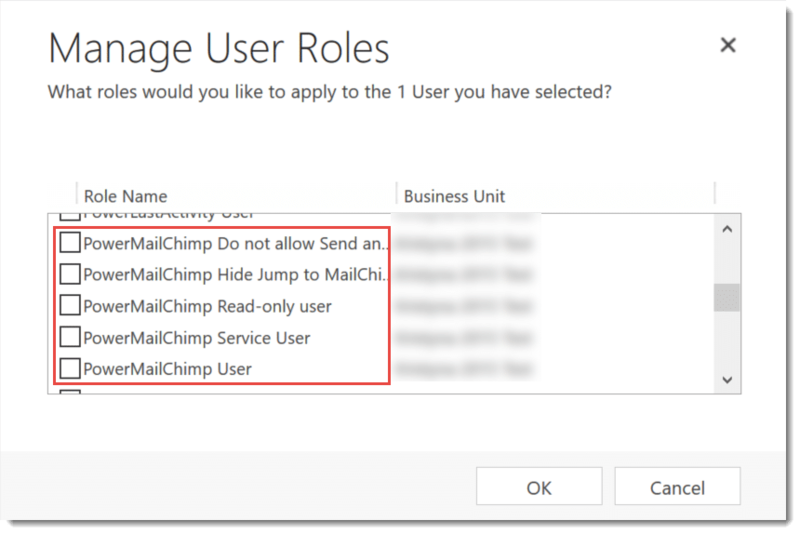 PowerMailChimp allows Administrators to restrict access to specific MailChimp template folders and MailChimp lists per CRM user. To limit which MailChimp template folders or lists a user has access to, simply navigate to the user record, change the user form to information and type in the name of the template folder and/or MailChimp list that the user should have access to (from the CRM side) in the PowerMailChimp section. If the user needs access to more than one template folder or MailChimp list, please enter each folder/list on its own line. If there is nothing entered in these two fields on the user record the user will, by default, have access to all templates/template folders, and have privileges to sync to all MailChimp lists. When creating your templates in MailChimp, you can choose to put the templates into folders, to help organize them. 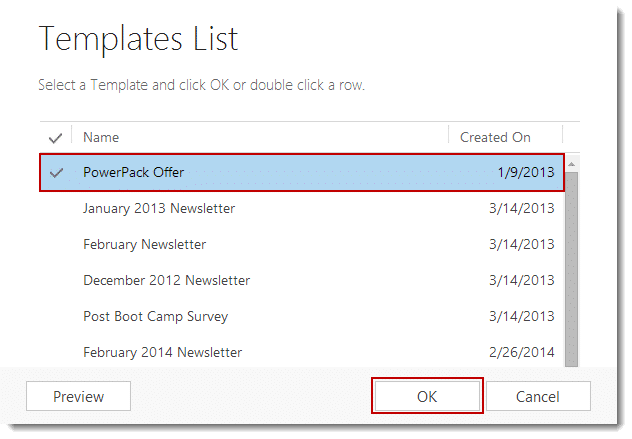 You can then choose to restrict access by CRM user, to which template folders the user can choose templates from when creating a PowerMailChimp blast inside of CRM. In MailChimp, it is best practice to have just one list that you will be syncing all of your CRM marketing lists to. However, if for any reason it makes sense for your company to have multiple lists in MailChimp, you can choose to restrict which MailChimp lists CRM users can sync their marketing lists to. 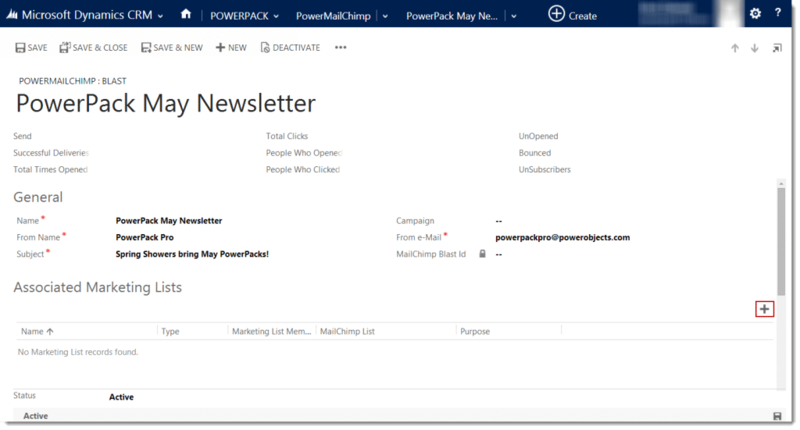 Once you have imported PowerMailChimp in Dynamics CRM, you will see a new set of options under the PowerPack section in the command bar; Marketing Lists, PowerMailChimp Blasts, and Organize Merge Tags. If you do not see these options, refresh your browser. 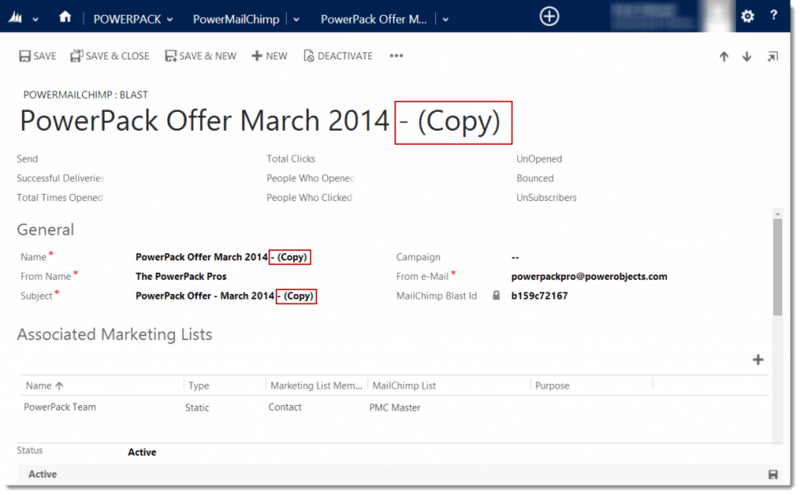 The first thing you need to understand is the relationship between Dynamics CRM Marketing Lists and the MailChimp Groups. Best practice for MailChimp is to create one Master List, then with each initial sync of a CRM Marketing List, a subgroup (with the same name) will be created within the Master List to segment the data. 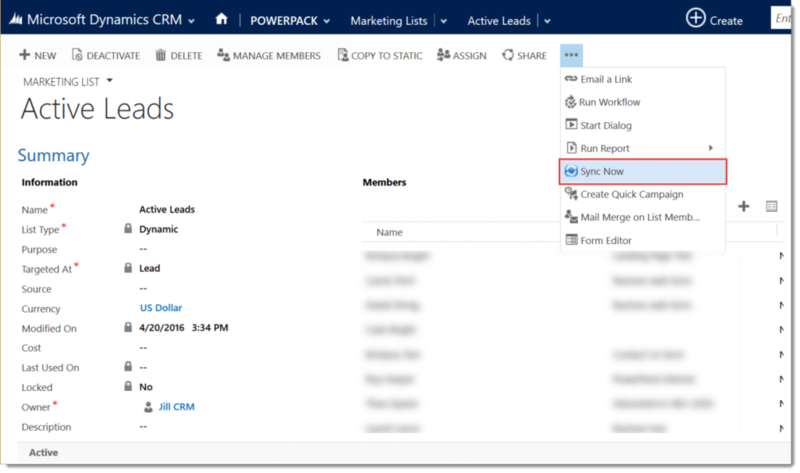 Note: You will need to create your Master List in MailChimp before you can sync a Dynamics CRM Marketing List to it. Note: You cannot have more than 60 groups in MailChimp at one time. 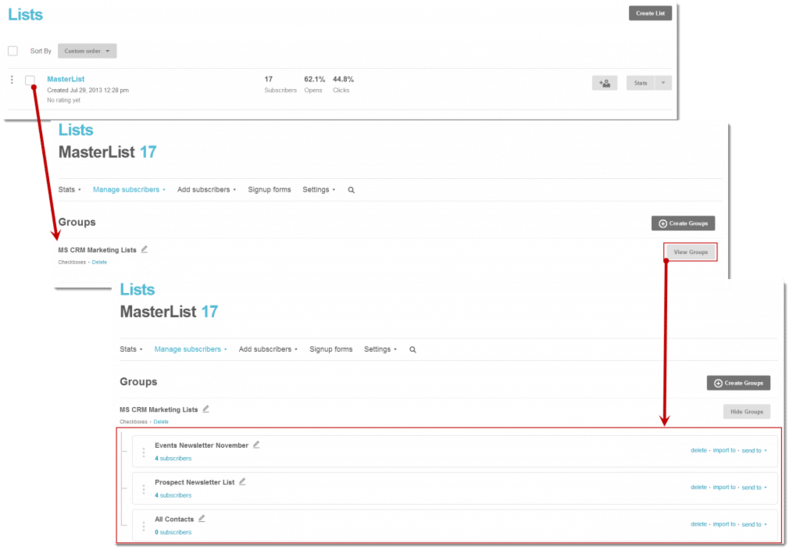 In other words, you cannot sync more than 60 CRM Marketing Lists under one Master List in MailChimp. Users can simply delete any or all groups in MailChimp to make room for new CRM Marketing Lists. 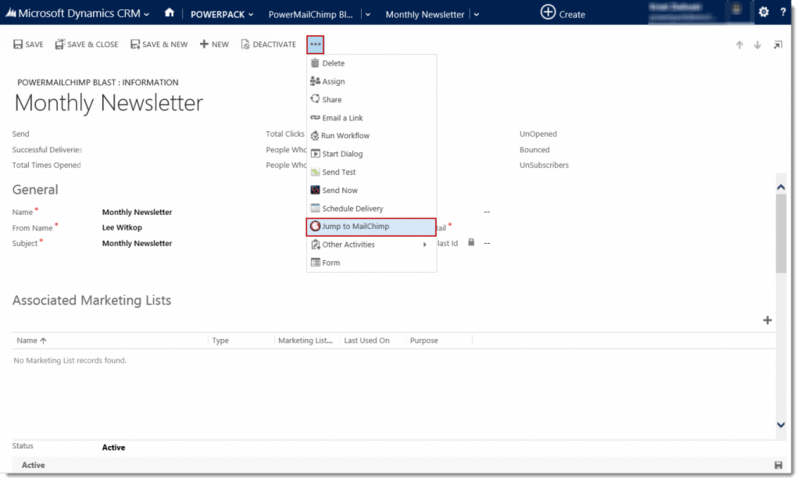 After importing PowerMailChimp, you will see a PowerMailChimp tab on new and existing Marketing Lists. Marketing Lists need to be manually synced prior to their first use, to associate them with MailChimp, and will automatically sync when added to future blasts. 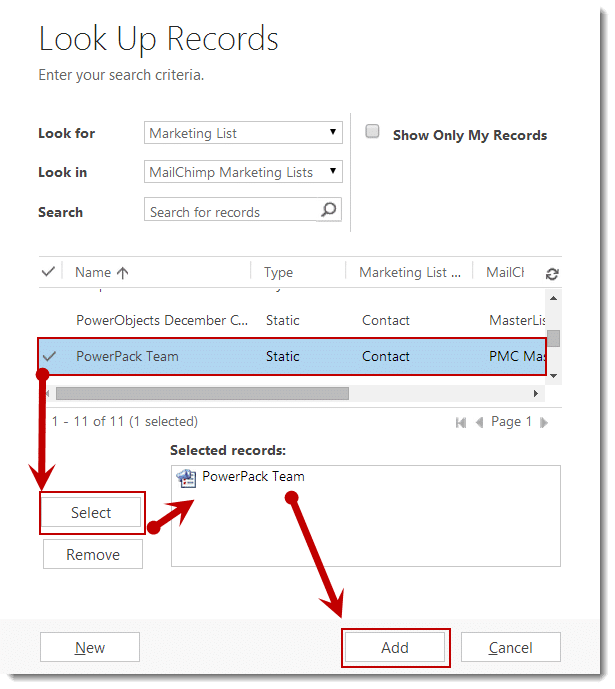 To sync CRM Marketing Lists, locate the PowerMailChimp tab on the Marketing List form and select the Select MailChimp List button. 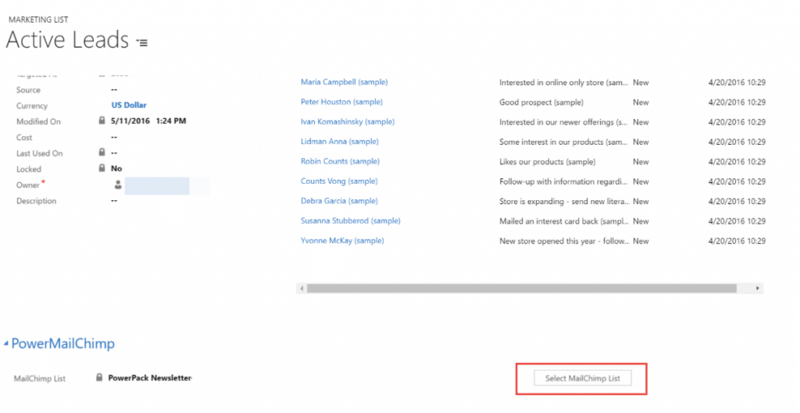 In the window, select the MailChimp List, select OK, and Save the Marketing List. Under the ellipses on the Marketing List, select the Sync Now button, and once the sync has started select Close. Once you have sync’d a CRM Marketing list with your MailChimp Master List, you will notice the ‘MailChimp Synchronized’ section will appear under the sub-menu for your marketing list. In the MailChimp Synchronized section you will find a record of the syncs for the specific Marketing List. This area will tell you the date of the sync and how many subscribers were added, updated and if there were any errors. If you have an error on the sync record, you can open that individual sync record and check why there was an error with the sync. 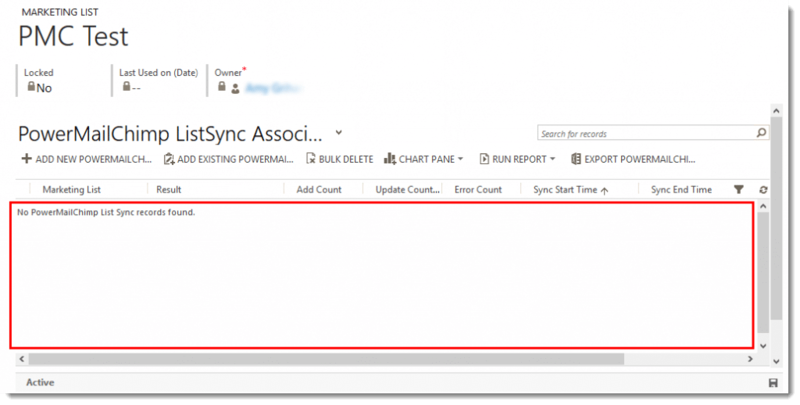 Once you select the individual sync record a new window will open where you can select MailChimp Sync Error(s) from the command bar. Remember, sync errors are not necessarily a bad thing. Errors could be that someone has unsubscribed and cannot be added back to the list or an email has bounced too many times and cannot be added back. If for some reason your Synchronization gets stuck, meaning you’ve clicked Sync Now, the process has started, but the process never completed, simply delete the Sync record, and click “Sync Now” again. However, remember to be patient, if the marketing list has a large number of members the sync will take longer. To set up merge tags, navigate in the command bar navigate to PowerPack and select Organize Merge Tags, then select the entity you would like to customize merge tags for: Account, Contact or Lead. Remember, you will have to set up merge tags for each of these entities individually in order for that information to get sync’d with MailChimp. Don’t forget to click Save after organizing your merge tags for each of the different entities. To use one of these merge tags in your MailChimp template, you would type *|name of merge tag|*. So, for example, if you wanted to use the Company Name merge tag in the screenshot below, you would type *|COMPANYNAM|*. Note: If you are syncing a time/date field, be sure that MailChimp and the CRM are in the same time zone. Also, please note that you cannot have more than 30 merge fields in MailChimp at one time. 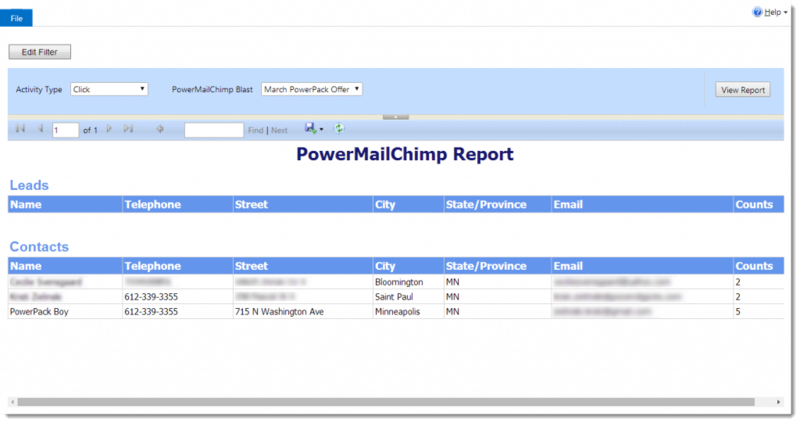 A PowerMailChimp Blast is a record that you must create to send a bulk email, all of the overall statistics of your email blast will be collected in this record. Also note that this record becomes read-only after sending and cannot be reused. Note: Before creating a PowerMailChimp blast you must create an email template in your MailChimp account. If you need help designing a MailChimp template, please refer to MailChimp. 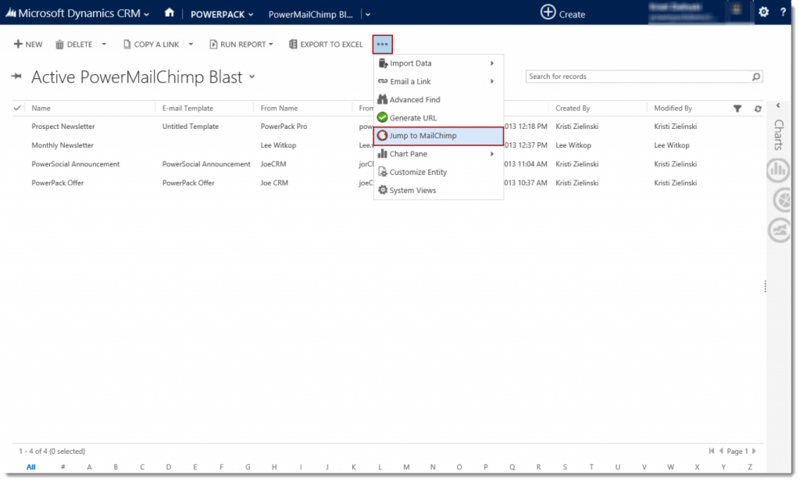 Creating a PowerMailChimp Blast is quick and easy. First, navigate to PowerPack then PowerMailChimp Blast in the command bar. Click on New in the upper left-hand corner and a new form will be created. Fill in the general tab information and click on Save in the lower right corner. You must save the PowerMailChimp Blast before you can associate a marketing list to it. 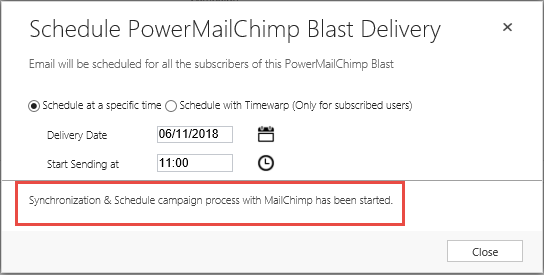 This is a required field and is the internal name of the PowerMailChimp Blast in Microsoft Dynamics CRM and will be reflected as the campaign name in MailChimp This should be a somewhat logical name as you will most likely need to come back and reference it in the future. The name field does not allow the use of special characters. Alpha or numeric characters. Each PowerMailChimp Blast requires a “From Name,” this is who the email is from when the recipient views it. This is the subject of the email being sent and will be in the subject line of the email when it is received. 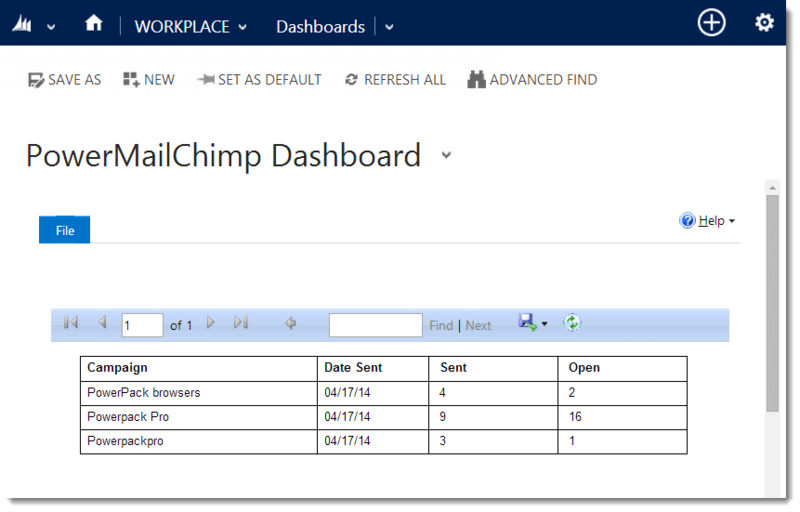 If desired, you can associate your PowerMailChimp Blasts to a Dynamics CRM Campaign. This is the email address that will be used when a recipient chooses to Reply to the email. Best practice would be to use a generic email address rather than an individual’s email address (ex. mailto:marketing@yourdomain.com). A unique ID will automatically be populated by MailChimp when the PowerMailChimp Blast is completed and saved. The MailChimp Blast ID signifies that the PowerMailChimp blast is ready to be sent. If you do NOT get a MailChimp Blast ID, something isn’t quite right and you will be unable to send your blast. Additionally, before a Blast ID is created, the solution will automatically sync your marketing list one last time to ensure data is up-to-date in MailChimp. Once you have saved the PowerMailChimp Blast, you can add CRM Marketing lists to which the email will be sent. Click the ‘+’ to the right of the Associated Marketing Lists section title and a search box will appear. If you do not get this option, please try saving the blast and try again. Select the list(s) that you want this PowerMailChimp Blast email sent to. Once selected you will be able to see the chosen Marketing List(s) in the Associated Marketing Lists grid. Note: When using more than one marketing list in your PowerMailChimp blast, the lists must all be synced to the same MailChimp List. This section directly relates to what data MailChimp will track and report on after the email blast is sent. Send, open, click, bounce, and unsubscribe statistics will automatically be written back to CRM. Turning on the Email Tracking or Advanced tracking options in CRM will turn them on in MailChimp for this specific email blast being sent. The default options are checked and will remain checked. The remaining options can be turned on based on your needs. For more information on these additional tracking capabilities please refer to MailChimp. Checking this box will track how many people open your email, by default this box is checked. Checking this box will track how many people clicked on various links in your email, which links were clicked and how many times; this box is check by default. If you have linked a Google Analytics account to MailChimp, selecting this options to pass Google data back to MailChimp; the Google data will not be visible in CRM. After selecting this option, a Title box will appear allowing you enter text to help identify the blast – by default this field will automatically populate with the blast name, date and time. Track how many people clicked on links in your plain text email, which links they clicked on and how many times, this is checked by default. If you have linked your Twitter or Facebook account to MailChimp, checking this box will automatically tweet/post a link of the email message for people to visit on the web. Authentication acts like a license plate for your email. It provides a traceable identifier which indicates you are probably legitimate, helping you avoid spam filters. If you have linked your online store to MailChimp, selecting this option will track when people click from your email blast, visit your website all the way to purchase. The last step in creating the blast is to choose the MailChimp template that you want to send. Please refer to the MailChimp website for further information about creating email templates. Click on Select MailChimp Template and select the appropriate template from the Templates Lis, if needed you can preview the template by clicking Preview button. Select OK to confirm you choice. If you need to make a quick edit to the text on your template, like correcting a typo or changing a date/time, you can do so directly from within Dynamics 365, but you will need to clone the blast first. 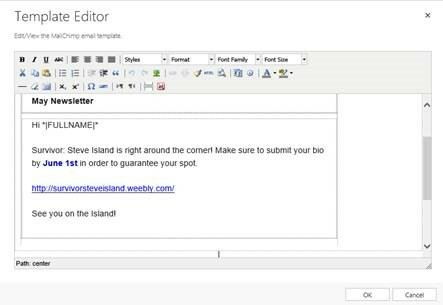 Once you clone the blast, you will see the option to “edit email.” You will want to click on ‘Edit E-mail’ to select MailChimp Template, make your quick edit in the pop-up window and click OK.
Once you have all the details specified for your PowerMailChimp Blast, be sure to click on Save in the upper right-hand corner to be certain you have captured all changes you made to the form. You will know that your blast has been successfully saved in MailChimp when you get a MailChimp blast ID populated back in CRM. You have 3 options: Send Test E-mail, Send Now or Schedule Delivery. You can send a test email up to 3 recipients, this is a great way see how the email will be rendered by different email services. 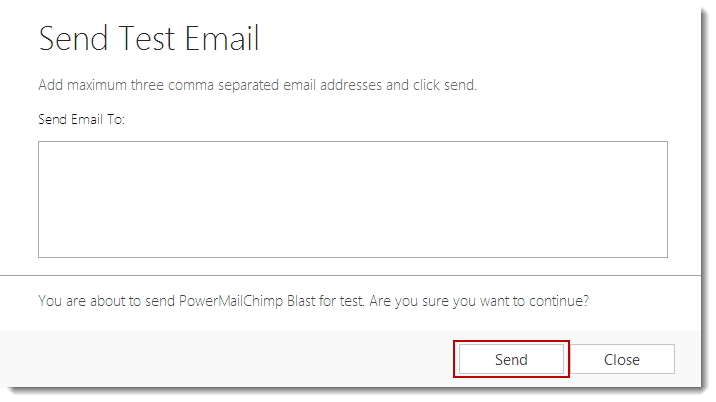 To send the PowerMailChimp blast immediately, click on Send Now from the ellipsis list and confirm that you want to send your email blast. 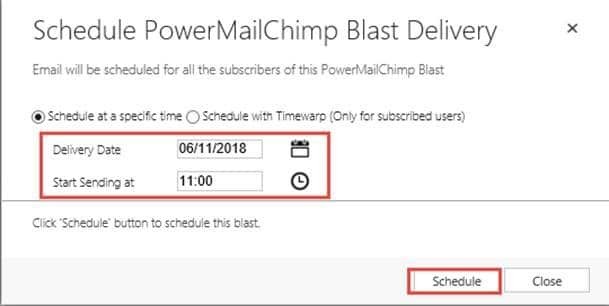 You can choose to schedule the delivery of the PowerMailChimp blast for a future date by selecting the Schedule Delivery option from the ellipses. As soon as you click on “schedule” the solution will check to see if the marketing list has been synced within the time frame you have set in the sync duration field in your PowerMailChimp configuration (you can check what you have your sync duration to by navigating to Settings>Solutions>Double click to open PowerMailChimp>MailChimp configuration>Sync duration). If the list has not synced within that time frame, it will automatically sync again. It is important to note that the blast will not actually get scheduled and will not go out at the scheduled time, if the marketing list has not been synced successfully. If needed, you can unscheduled the blast by selecting the Un-schedule Delivery button in the ellipses menu. Note: When a PowerMailChimp blast is sent the form becomes read-only. If at any time you need to navigate to your MailChimp account, simply click on the “Jump to MailChimp,” button found in the ellipsis. This button can be found on the main PowerMailChimp blast view, as well as on each individual PowerMailChimp Blast record. 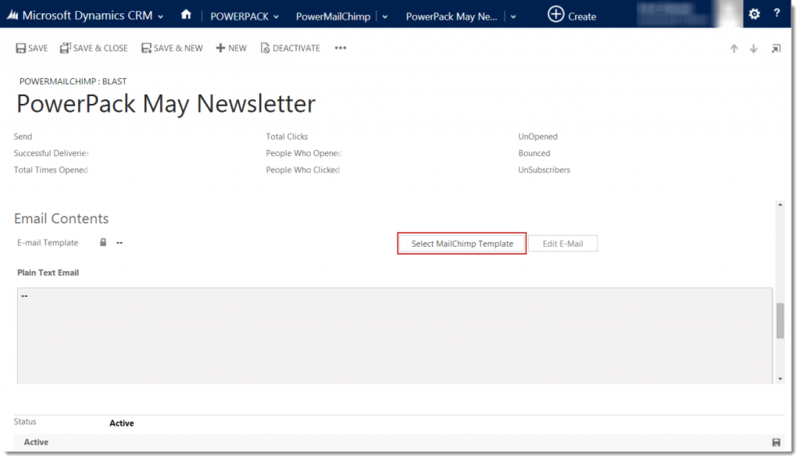 If you’d like to copy an existing PowerMailChimp Blast open the PowerMailChimp blast you would like to copy and select “Clone Blast,” from the ellipsis dropdown. When a copy of a blast is created, “-copy,” will be added to the PowerMailChimp blast name, from name, and subject field. All parts of the blast, including the marketing list, template selected and PowerMailChimp Blast form fields will be copied. If the MailChimp template has been changed in any way, you mush reselect the template to update the blast. If you are subscribed to PowerSurveyPlus, you have the ability to send a survey within your bulk email and track the survey responses back to the email recipient’s CRM record. To add a PowerSurveyPlus link to a blast navigate to the survey. 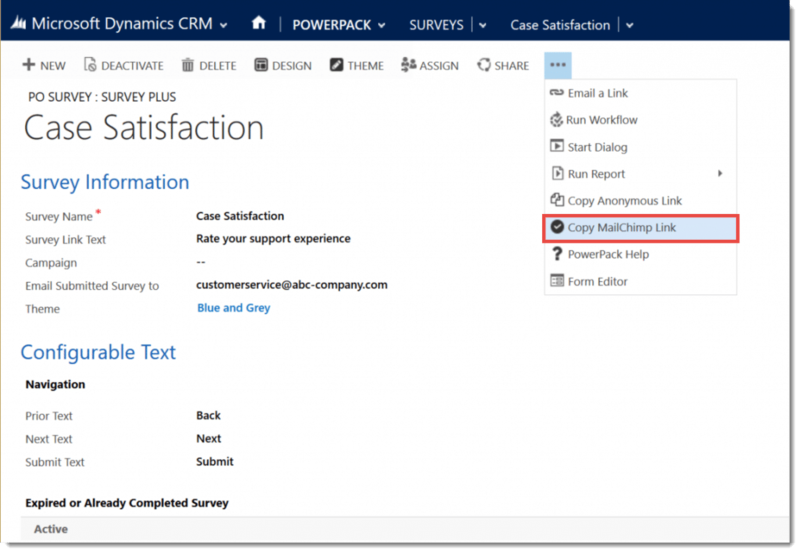 On the survey, select the Copy MailChimp Link, and copy the URL from the pop-up window. Use this link in your MailChimp template to direct users to your survey. If you would like to delete a blast in CRM for any reason, you may do so. However, please know that if you delete a PowerMailChimp Blast all activities (opens, clicks, unsubscribes, etc.) that were associated to that blast, will also be permanently deleted. If you delete a blast in CRM that blast will also be deleted from MailChimp. 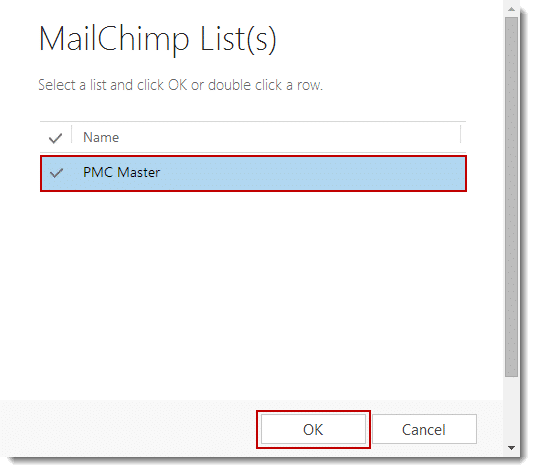 Deleting a PowerMailChimp blast in CRM or a campaign in MailChimp is not suggested. Note: You cannot delete a MailChimp campaign that has been sent in the past 7 days. 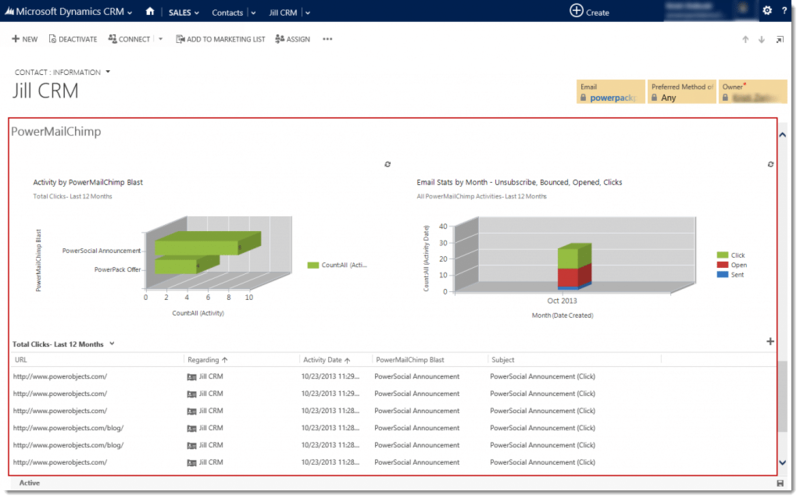 After a blast is sent, the MailChimp statistics are tracked back to the corresponding blast and Account, Contact, or Lead record within CRM. Blast statistics are synchronized from MailChimp into Dynamics CRM at regular intervals after the email blast is sent, with the length of the intervals decreasing after a period of time, as the open and click through rates naturally taper off. Once per hour, for the first 72 hours after the blast is sent. Once per day, days 3 – 6 after the blast is sent. Once per week, weeks 2 – 4 after the blast is sent. You can also choose to manually sync a PowerMailChimp blast by opening the blast and clicking “Sync”. Please note that this button is only available after the PowerMailChimp blast is sent, and if there is no sync currently running. The header will show some raw statistical data, and the Dashboards section on the record allows users to dig further into those statistics, as well as view individual’s blast activities. To see the statistics on the record navigate, to the record and scroll to the PowerMailChimp tab. This section will show you all of the bulk email actions that this particular recipient has taken. Within each PowerMailChimp activity you will see the activity type (send, open, click, bounce, unsubscribe). 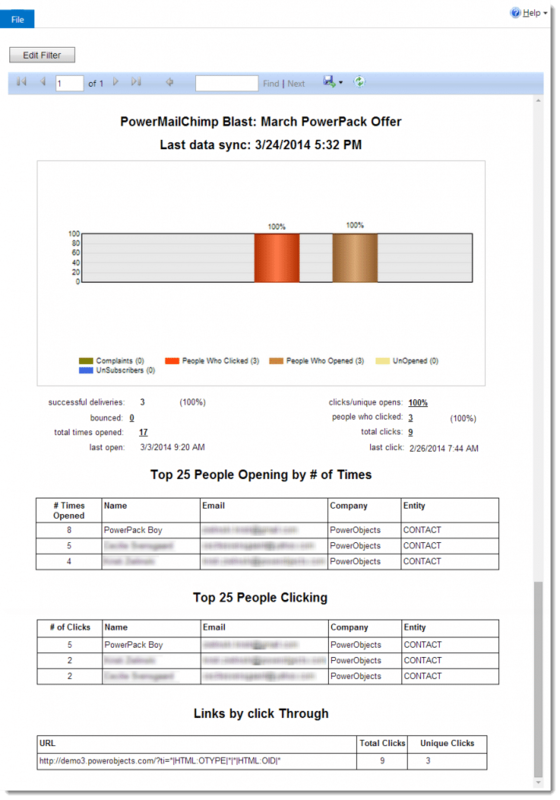 Each activity will list which bulk email the activity is associated to, as well an activity date. The PowerMailChimp Activity Summary will allow you to select an activity type (send, open, click, etc. 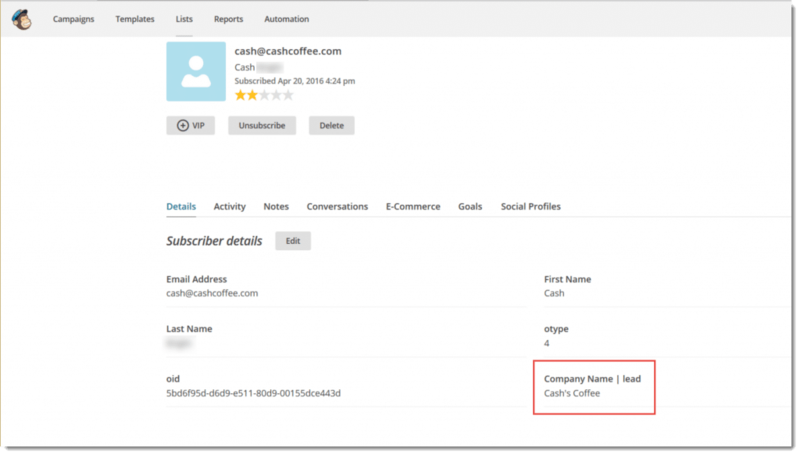 ), choose a PowerMailChimp blast and list all leads, contacts or accounts that have that activity type. The report will list the person’s name, phone number, street, city, state, email address and the number of time that activity occurred for that person. 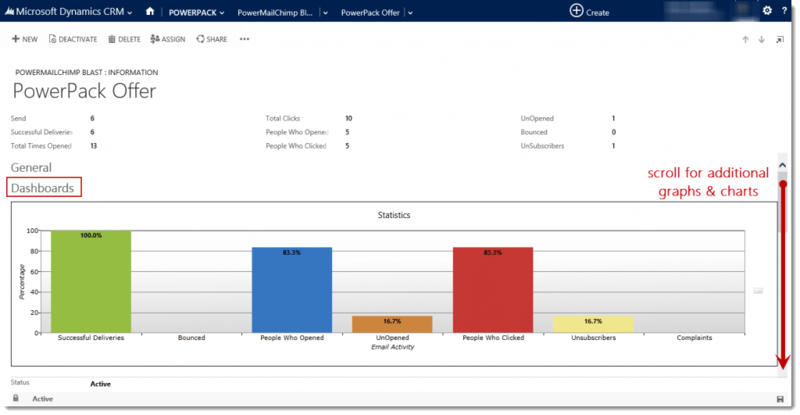 The PowerMailChimp dashboard will appear in the list of dashboards that you have in your CRM system. This dashboard will list all of the PowerMailChimp blasts that you’ve sent out in the past month and the activities associated to those PowerMailChimp blasts, in summary form. When someone unsubscribes from your PowerMailChimp blast, an unsubscribe activity type will be created and associated to that individual’s CRM record. The unsubscribe activity does not automatically remove the recipient from your CRM marketing list or change their record’s bulk email to Do Not Allow. If you try to sync the person in the future, MailChimp will prevent it. Within the unsubscribe activity, you will see the MailChimp list the person unsubscribed from and the reason unsubscribed (if given at time of unsubscribe). To uninstall PowerMailChimp, first delete any PowerMailChimp Blasts you created. Then uninstall as usual, by deleting the solution. Deleting the solution will remove all records and activities associated with PowerMailChimp, including any PowerMailChimp activities. If you would like to keep this information in your system, you can simply unsubscribe and leave the solution in your system. Thank you for your interest in PowerMailChimp, should you choose to subscribe you will be charged $2/enabled CRM user/month. If you have any questions or run into any issues with PowerMailChimp, our friendly support team is here to help!